I think it is unwise to appeal to the philanthrophy of the rich to alleviate social inequality. The US is on a per capita basis very generous philanthrophy as % of GDP wise however it is by far the most unequal nation in the developed world. Frankly I view Premjis $2 billion gift more a PR exercise as Wipro of late has been trying very hard to get good press like Infosys with its middle class founders do. Premji ofcourse hails from old money and unlike all other large IT companies controls something like 80% of Wipro share.Infy founders own less than 5% of shares. The way he has shoved out very competent professionals like Vivek Paul to make way for the succession of his eldest son is more the instincts of a 'lala company' than a diversified modern MNC he wants Wipro to be perceived by contrast NO IMMEDIATE RELATIVES of founders are allowed to work in Infosys as per Infosys code of ethics. The solution and indeed the responsibility of addressing inequality has to come from the state which needs to provide high quality education to all and actively enforce legislation against gender,caste and disability discrimination..
anon: "I think it is unwise to appeal to the philanthrophy of the rich to alleviate social inequality." This is not an appeal. It's a reminder that philanthropy to alleviate peoples' suffering is in the best enlightened self-interest of the wealthy who constitute a small island of prosperity in the midst of a vast ocean of abject poverty in countries like India. anon: "The US is on a per capita basis very generous philanthrophy as % of GDP wise however it is by far the most unequal nation in the developed world." The US being unequal does not imply that it has millions of poor who are going hungry or being left illiterate and sick, which is the case in South Asia, particularly India. The European style tax-payer funded safety net is good, but civil society and philanthropy are essential parts of a functioning democracy. Eventually, the bulk of the money comes from the high-income segments of society. Also, TCF (The Citizens Foundation) should be mentioned, it runs hundred’s of schools with 90+ thousand kids. They just raised 900K in Seattle last week .. But even then 20% of children in the US don't have medical insurance and that's a pretty sorry state of affairs. 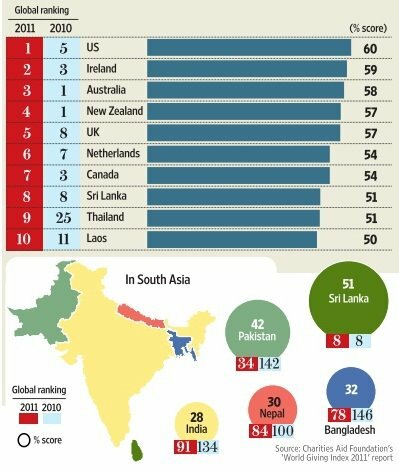 and please Pakistan is a lot poorer than India so lets leave out the 'particularly India' part of it.India doesn't survive of international charity or ..ahem..enlightened self interest driven aid like Pakistan does. Incidentally why aren't you quoting 2011 figures for comparing poverty etc between india and pakistan ? 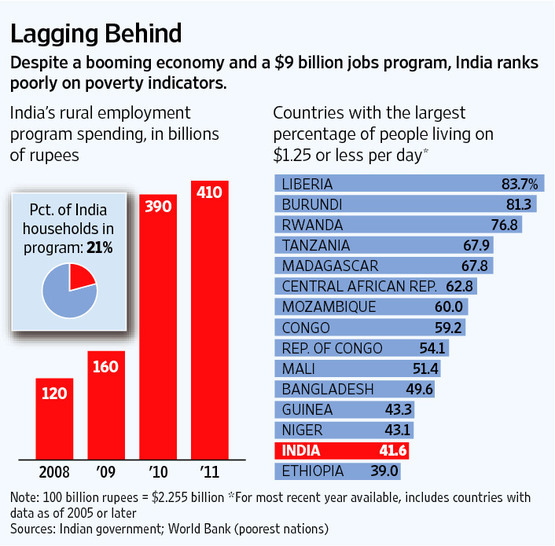 anon: "Incidentally why aren't you quoting 2011 figures for comparing poverty etc between india and pakistan ? " What 2011 figures are you talking about? Please give me a reference and link to credible data from an international organization. I fully agree with your comment about South Asians (or may be Asians in general) not donating enough money. But I am not sure, if I agree with the reference you provided. According to your link Mr Malik Riaz Hussain has donated upwards of $2 billion, but it seems his networth is hardly $800 million. In case of Azeem Premzi he has large shareholding in WIPRO, but it simply does not add up for Mr Hussain. Again, I don't want to criticize. Its just that something seems wrong. Pavan: "An interesting point is that only 10% of the total amount donated is by corporates and individuals." South Asians do have a long culture of giving, but much of it goes to household staff, the immediate community or the local place of worship. 1. The culture of organized, charitable giving by rich Indians and corporations has been slow to develop, even though the number of super-rich is growing rapidly as the economy grows rapidly. 2. India has 52 billionaires and over 125,000 millionaires. 3. And, as you said about India, individual and corporate donations made up 10 per cent of all charitable giving in 2009, compared to 75 per cent in the United States and 34% in UK, according to a study by global consultancy Bain & Co. The rest of it comes from federal, state and local governments. I guess I am with you there. I am not sure about Pakistan, but Indians tend to hardly give any money to charities, but they readily cough up money for religious causes. There is hardly a day when we don't have strangers asking for donations for some religious dining. Temples like Tirupati end up earning to the tune of over 500 crores per year, and it surprises me that the very same people who empty their pockets in the Tirumala hundi, hardly pay a penny to the needy. With my limited interactions with Chinese colleagues I know that its even worse for them. Many of them officially don't have a concept of God - so religious donations are ruled out. And donations for charity are even more rare with them. I guess US is way better in that regards. Partly it may be because of the general affluence. It may be also because being a relatively new society, where almost everyone has been a migrant within the last 5 generations. It makes sense to give to a society that made you rich. Please read about Sir ratan tata trust which does a great job. They might be contributing to an extent of 2000 crore every year. Beyond that, there are lot of ngo to which ordinary middle class contibute. I would not know how these numbers are churned out by these surveying agency. It is not the question of who is number one or number two and what is important is that enough to handle the challenge of the society. As per this site there are approximately 35000 ngo which are registered or data collection by indinangos. Donations to religious institutions are a big part of giving everywhere, including the United States, India and Pakistan. And, in the United States, donations to places of worship qualify for tax deduction. 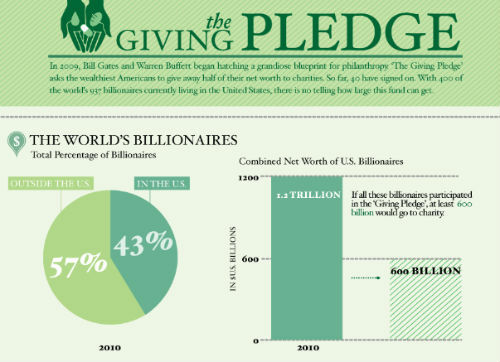 • Giving USA, a non-profit foundation that studies philanthropy in the United States, in its 2008 report found 33.4% of estimated total giving, $103.32 billion, went to houses of worship and denominational organizations in 2007. • Five percent of American Christians overall (8% of all Protestants and 2% of Catholics) tithe, according to a 2008 study of giving by the Barna Group, in Ventura, Calif. Protestants gave their church an average of $1,705 per household and Catholics gave $984, while those in non-Christian faiths gave an average $905, Barna found. • Six in 10 people gave something to their house of worship last year, according to the 2008 Baylor Religion Survey, based on 1,700 U.S. adults, released in September. About 47% gave less than $500, about the same as in 2005.
as far as pakistan goes, it was claim by one organization within pakistan. There are no other objective data but for a news item given. News item are the most easily manifestable in pakistn is well known in the world. More than institution it is the unorganization philanthropy which goes a long way. This mountaineer shares his experience that when he start his adventures, it was individual from middle class which contributed rather than institution. Smaller the organization is better placed in servicing rather than big centrlaized as it become powerhose of finance and corruptin like our governments. Pranab Mukherjee has just revealed the outlines of India's 2011 budget. I think the double digit increases of 24% and 20% on education and health care in 2011 Indian budget are a much-needed welcome change. What is not reassuring, however, is the fact that social spending still lags defense in India, a country with the world's largest population of poor, hungry, illiterate and sick people. I think taxes should also be counted as ''philanthropy''. hope you understand what i'm tryin' to say !! How selective are you in choosing information to prove your points. 1. Considering all your parameters, social involvement, charity etc etc etc, tell me honestly, given a choice would you rather be born in India or Pakistan today. Between India and China I would be born in China, and if US was included I would rather be born in US. Don't present any patriotic arguments against this. All said and done, it is economic development which matters. True, India has the most hungry mouths in the world, but the number has come down rapidly in the last decade primarily due to economic development. Economic development is the single largest contributor to poverty alleviation. True India's wealth has mostly benefited the rich, but it is now trickling down to the poor. Average wages are rising quickly and so are coverage of government's social programmes because the government has more resources at its disposal(after stupid defense budgets and interest payments take away their chunks from the fiscal budget). 2. You will agree when I say that fifteen years from now, the disparity between India and Pakistan is going to be as much as between India and China now. You can continue to post your musings, bashing up India and showing Pakistan better in every field. But just saying things are better doesn't actually improve them. Its called fundamental realism. 3. But India can definitely do better on charity. Charity also develops in phases just like economy. India is in the second phase where the novou riche are slowing beginning to accept the concept and with the next generation there will be a lot more participation. 4. The maximum contribution in India is to religious causes today. I pray that people understand the broader issues of poverty and come out of the quagmire called religion. Religion has caused more deaths in our country than all the wars put together. But next 25 yrs, as we grow literate and get our intellectual capital, we will surely let go of this devilish concept which spreads more hatred then foster peace. But Pakistan I guess wants to get Talibanised, so I don't know what will be the literacy rate then. to get some idea about what is happening on the economic and social front in your country. Prepared by your beloved partners and donors American defense dept(Also time we all started to understand that these Americans are nobody's friends, just do everything to further their own interests including their current operations in Libya. They dint do anything in Egypt or Yemen cuz they have no oil, but Libya yes, has oil, so they have to intervene). 5. And lastly, get your house in order before you pin-point outside. You don't even have a consistent democracy in the last 60 years. Did you also notice most of the autocracies/dictatorships in the world are in Islamic countries. Any idea why? Anand: "Considering all your parameters, social involvement, charity etc etc etc, tell me honestly, given a choice would you rather be born in India or Pakistan today." It's strange that you make such a preposterous without first doing a real fact-based comparison based on first-hand information. I have personally visited and compared life in two nations and I can tell you with first-hand knowledge that an average Pakistani lives a better life than an average Indian. Doing an objective comparison using UNDP and WHO data will show you that Pakistanis on average live three years ago longer, and are less poor, hungry and sick than their Indian counterparts. Anon: "Article on Indian philanthropy." Thx for sharing the article by Aaker Patel. Your work is highly appreciated but at the same time I would like to mention that I am highly disappointed with the irresponsible attitude shown by you by posting a pic in which Pakistan's complete map was not shown. You being a responsible individual need to be more careful. Disputed Jammu and Kashmir has to be shown disputed area and not part of India. I hope this will be rectified at the earliest.